I just love how this community is growing! We had 118 posts linked up last week that were excellent! And I just love what you ladies link up, so I'm going to start featuring a few each week that really encouraged me. If I feature you, I'll send you this button for your blog. ABC Reflections talking about "Unhurried Time". BeneaththeSurface-Dawn sharing"Motherhood: Gavel or Grace"
DonnaReidland.com talking about "Small Comprimises or Big Trouble"
IntoxicatedonLife.com sharing"The Last Dance with my Husband"
Well, here's a short video sharing the heart behind it. But, enough of my excitement and vision casting and on to what we need right now. 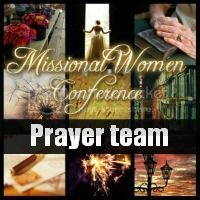 We are looking for a team of prayer warriors to pray for the conference. Planning is super important but prayer is essential! Our prayer team leader, Lyli, will be sending out updates and requests that we really need prayer for and we would love for you to be part of the team to pray for those. Will you? If you want to be part of the prayer team fill out the form below and we'll bring you into the loop. And I even made a cute little button to stick on your blog to remind yourself. Just copy and paste the code onto your site. And don't forget registration for Missional Women Discipleship Groups opens TODAY and closes next Friday!!! Check out the Discipleship Groups Tab to learn more if you haven't heard about these yet. I am a huge admirer of yours especially with your mission-minded focus here on Missional Women. Congratulations on the conference once again ! I just want to say that God bless you and may He continue to give you the strength you need to keep shining and working hard in the Kingdom. Thanks for hosting this Blog Link Up today ! Thank you so much Gertrude for the affirmation, it means a lot to me (it's my love language). Glad to! And don't even worry about the typo... I TOTALLY understand, you should see my text messages. lol! Thanks so much for featuring my post. I appreciate it. 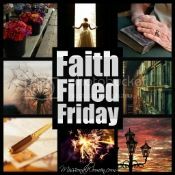 I am so excited that when I wandered on to Mary Hill's blog this morning I found buttons to Christian blog hops!!!! Who knew?!? !